After ordering the pause menu, we've been able to use this mockup concept when showing off the game at trade shows, as it gives the audience a good idea of what to expect from the game. Hey Lightning Saburo. I was going to send you another status screen request, but the artist I was working with isn't available to do the next game so I'm going to have to wait until I get new sprites before I order any more status screens. There also might be a bit of a break between this project and future ones too, it just depends on how things go. 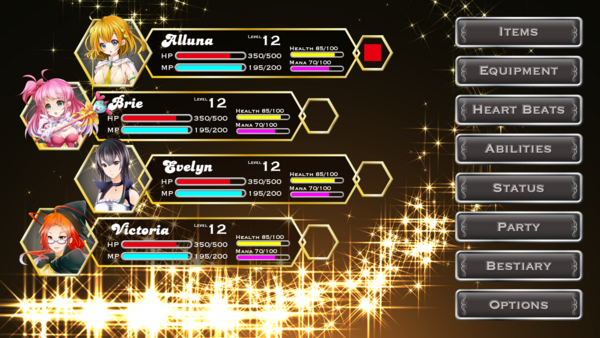 I'd like it to show four character portraits on one side the screen, which would show the character's Name, Level, HP and MP, while also leaving room for any status effect symbols when those are added to the game. I'd like there to be a health bar and mana bar as well as numbers above the bars to show their minimum and maximum health. Similar to the other menus, it would be great if there were two versions for each of the buttons, one for when they're idle and another for when the mouse hovers over them. If you've got any additional questions let me know!